Strong, reliable good value chain. With regular cleaning, good for thousands of miles. Good chains and they have not failed. High quality. Great price. Easy to install!! Great stuff from Shimano, as always. Would be nice to include some kind of powerlink, rather than just a snap-off pin, but I'm getting smooth shifting paired to a Shimano HG400 cassette. This chain combined with the HG400 cassette has proved to be an excellent purchase. I've used it on my son's Stumpjumper and it works faultlessly. I using this chain with CS-HG400 cassette and M590 drivetrain; working very well..
Great product. However, a wipe before hitting the road is needed. Otherwise, it will be grimed with sands and dirts. Slick shifting for a great price. Never been confident with the connecting pin before but trust it now happily. 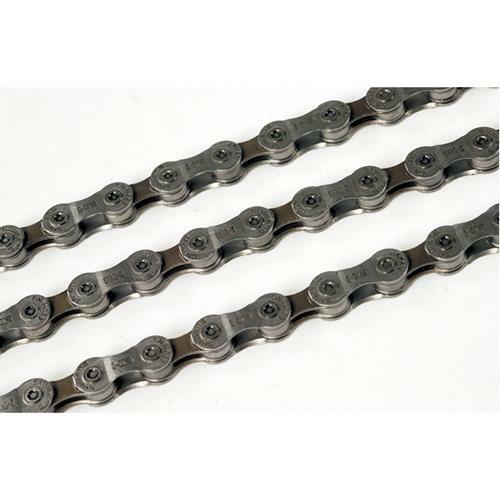 Fantastic chain, good quality and cheap enough to replace regularly. Bought the chain to service a friends bike & it delivers top quality smooth shifts along with the deore cassette. Still the same rating from me and on both bikes now, reliable as ever. I have never had a chain failure with these even when using Sram power link to join. These chains are great and value for money, cheap enough to change regularly and not wait til the sprockets are knackered too. They never fail. Great product, supplied with only 1 chain pin - so make sure you get the length right before using it (not that replacements cost much anyway!). As always Merlin were speedy with getting my order to me - Thanks! Using these on my commuting bike, shifts nicely, lasts well. Cheap to replace, what's not to like. I usually go for an HG90 chain but am really pleased with this well priced alternative. Good clear fitting instructions and a well running chain now on the bike. Thanks Merlin as your service and postage times are always top notch! Great product at a great price - does exactly what you would expect it to. Topped off by excellent customer service from Merlin Cycles. Always used these as they fit both my mtb and road bike. This chain lasts (and survives lack of tlc) and is excellent value. i use these chains on my commuter 20 miles a day five days a week. Previously I used more expensive chains made by SRAM and probably rode them for too long. Now I buy this cheap as chips Shimano chain keep it well lubed with waterproof oil and change every 3 months or so. This way I prevent wear and tear on my drive train. Don't mess about with the Shimano Joining pin, they join perfectly with the SRAM Power Link, then you can remove it routinely off the bike to soak it in solvent and relube it. Personally I think it stretches less than the SRAM equivalent and gives a better gear change. But it will rust quickly if you don't use a waterproof lubricant. Great price for a no frills shimano product!! Quality chain from Shimano, who needs to pay more. Link/connecting pin design makes fitting so much easier. Great value chain made better at Merlin prices! same as my last chain, good value & works perfectly. Good basic chain, does exactly what its meant to with no issues. Does the job. Excellent value for money. No need to pay any more. I currently have this chain on my bike and find it to be good quality and durable. I brought this purchase as a spare for the Megavalanche MTB Downhill Enduro race over in Alpe D'Huez in France.